Trade Bank of Iraq (TBI) has signed a Basic Loan Agreement for financing loans with Commerzbank to support small and medium sized projects in Iraq. The Loan Agreement was signed at the back of TBI being approved by Germany’s export credit insurer Euler Hermes as a borrower for medium and long term Export Credit Agency (ECA) financing with repayment terms of up to five years, said a statement. TBI aims to support public and private sector projects up to a business volume of €100 million ($115.30 million) and facilitate financing of export contracts for products, materials and machines. The newly-signed loan agreement focuses on the financing of export contracts awarded to Commerzbank clients in Germany and other European countries, it said. The signing of this agreement is part of the long-term strategy of TBI to source and secure funding for projects in Iraq, which will create new opportunities for employment and accelerate the process of economic growth, it added. The institution’s financial network and expertise plays a significant role in sourcing and securing funding for projects. It established its first international office in the UAE in 2017 and has since signed several agreements with international banks and finance firms to help fund infrastructure projects inside Iraq. 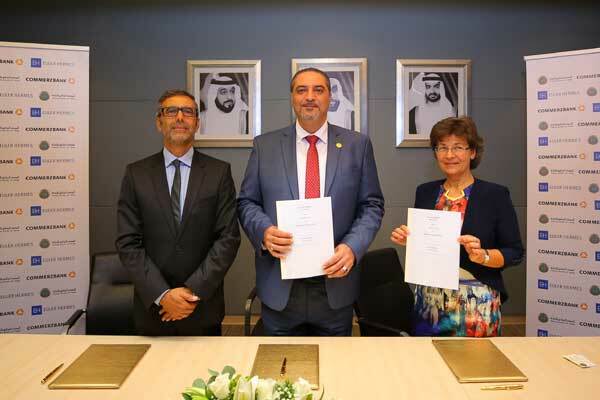 The MoU with Commerzbank was officially signed at TBI’s representative office at Abu Dhabi Global Market on Al Maryah Island in the presence of senior representatives from Commerzbank and Euler Hermes. “Thanks to the backing of Euler Hermes, funds will be transferred directly by Commerzbank to suppliers from Germany and other European countries ensuring the success of the suitable projects we identify. The SMEs will get access to the supplies and machinery with excellent repayment terms,” he said. “We are committed towards the upliftment of the Iraqi economy by partnering and engaging with various stakeholders to help Iraqi businesses to realise their ambitions for growth,” he added. “This agreement is further evidence that we remain committed to our mission to create new trade and investment links between Iraq and rest of the world,” he concluded. “Through this framework we will support Iraqi companies seeking to do business with our clients in Germany and other parts of Europe by offering long-term funding for various projects in the future,” she said.